Social contests are like your precocious, 8-year-old nephew. They seem smart, you’re not sure you understand them, and 10 years ago they didn’t exist. So what are social contests? And should you consider running one at your business? I recently did a search to find some information about running social contests. The latest post I found was an article from July 2014. Most of the content I found was from 2011 or 2012. That’s about 30 years ago in internet years. 2011 feels especially dated considering how digital marketing has evolved in recent years, with social media changing at an especially rapid pace. I’ve spent the last 2 1/2 years running growth at Heyo, a social contest platform for small businesses and agencies. We see thousands of campaigns run every year at Heyo, and it’s time for some updates. Let’s examine what a social contest is, why you shouldn’t ignore them, and how to successfully run one in 2016. Social contests are promotions targeted largely to a social media audience. They include simple giveaways and sweepstakes. They also include more sophisticated contests like a photo contest where you enter via hashtag, or a video contest where you shoot and enter some film with your smartphone. They’re a great way to engage your audience and can even help you build your email list (more on that later). They were ridiculously popular during the heyday of Facebook tabs (2011-2013), but social media for brands has changed a lot since then. 2007 – Facebook launches Fan Pages. This becomes the first, serious social platform for brands. 2007 – The hashtag (#) first debuts on Twitter. This will become an easy way for consumers to enter a social contest for years to come. 2009 – Facebook enables Fans and Promotions. Now brands can build an audience on Facebook and leverage promotions (like contests) to broaden and engage with that audience. 2010 – Instagram launches. This provides a strong social platform that is entirely dedicated to visual content (images and video). 2011 – Pinterest launches. This provides another social platform from which brands can launch a social contest. Pinterest, like Instagram, is all about visual content. 2012 – Facebook fan pages convert to Timeline. Businesses can no longer set a tab as the default landing experience. This reduces the value of a Facebook app (tab). 2014 – Facebook updates Pages and removes the Like Gate option. 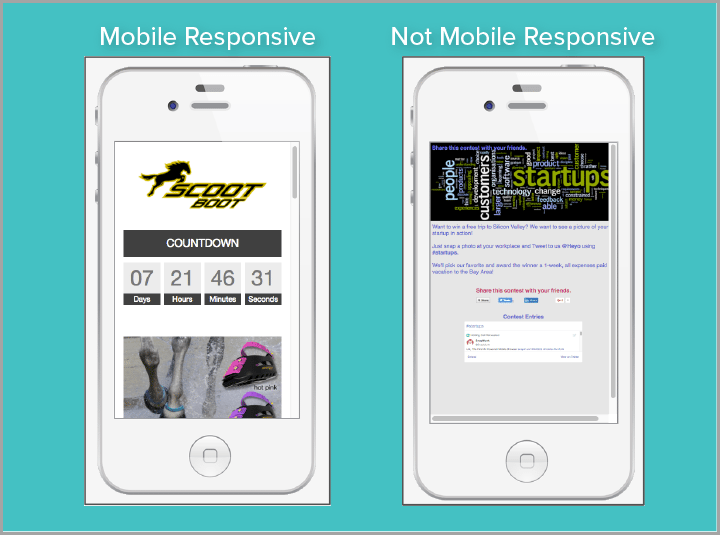 This reduces both the visibility and commercial value of Facebook apps. Social contests were born 5-6 years ago as a creative way to build and engage with your fanbase on Facebook. At first they were primarily seen as “Facebook contests”. Over time Facebook has systematically devalued “tabs”, making the it tougher for brands to use contests to organically grow their audience on Facebook. 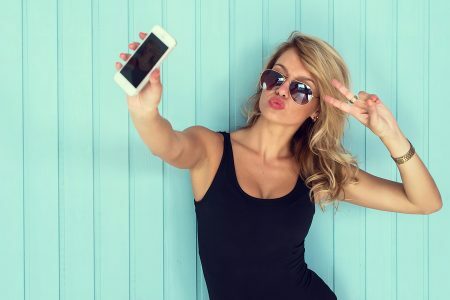 Over that same time, the rise of hashtags and the launch of new social platforms like Instagram and Pinterest have made social contests much more dynamic. Brands now have more options at their disposal and can accomplish different goals with social contests. Why should I run a social contest? 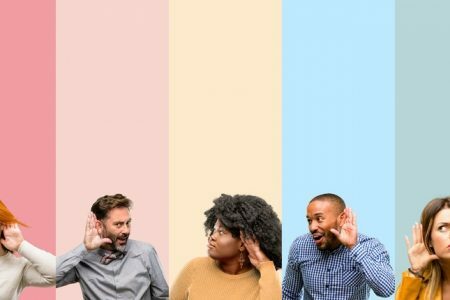 With the social media landscape so different today than it was a few years ago, you may be wondering if businesses can still have success running social contests in 2016. 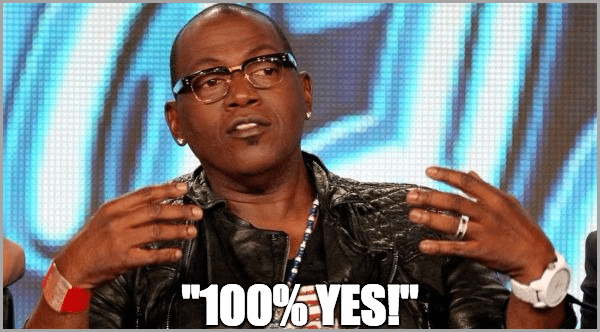 The answer is (in the words of Judge Randy) “100% YES”. Let’s start with the basics. Why should a business run a social contest? There are two reasons. I’ve been doing online marketing for years now and I still haven’t found a better way to gather a large volume of new email leads in a short amount of time. I have many examples I could share from my time with Heyo. Here’s one. 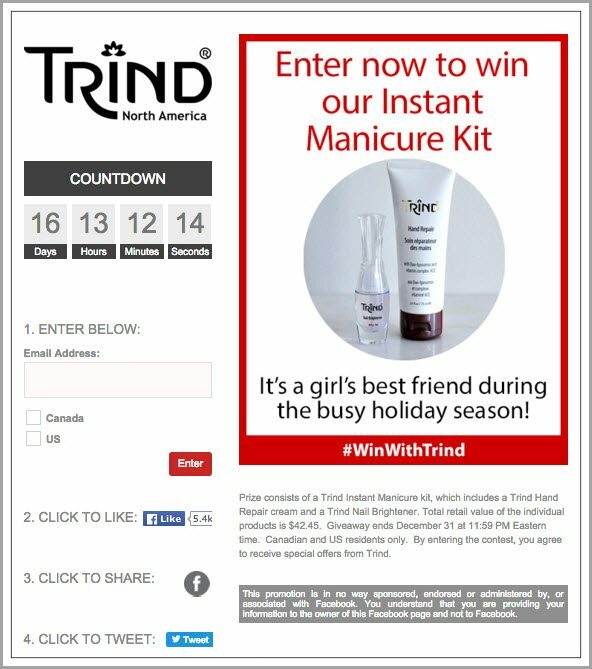 Trind, a small Dutch cosmetics company, recently ran a giveaway and gathered 930 new email leads in a little over two weeks. For a company with fewer than 6,000 Facebook fans and a small email list, this was a huge success. Passive lead collection like a free download or newsletter sign-up form won’t give you these concentrated results. Running a social contest can get your audience liking, commenting, and sharing. This is a great way to both deepen relationships with your fans and build awareness with others. As I’ve already mentioned, businesses are still running social contests in 2016, even as the landscape online has become more dynamic and complicated. Here are a few examples of successful social contests that are running as I write this article. 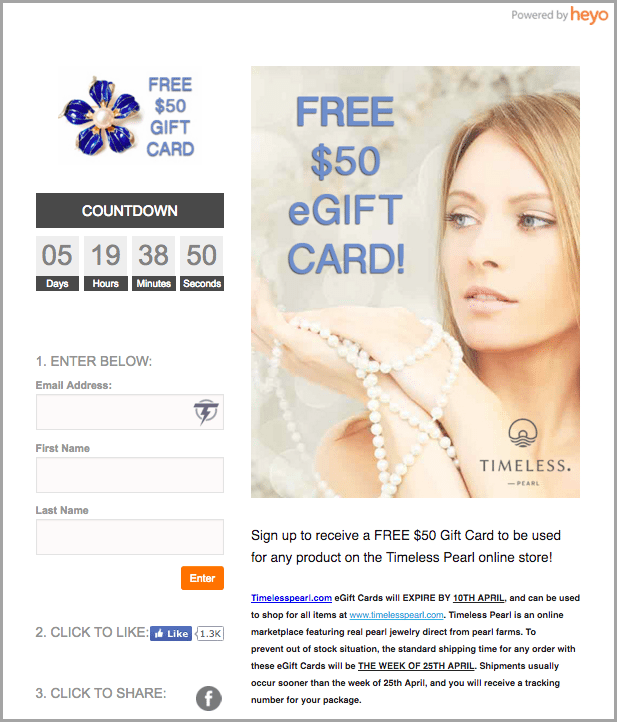 Timeless Pearl – This simple giveaway is converting at 34% for the small jewelry company. 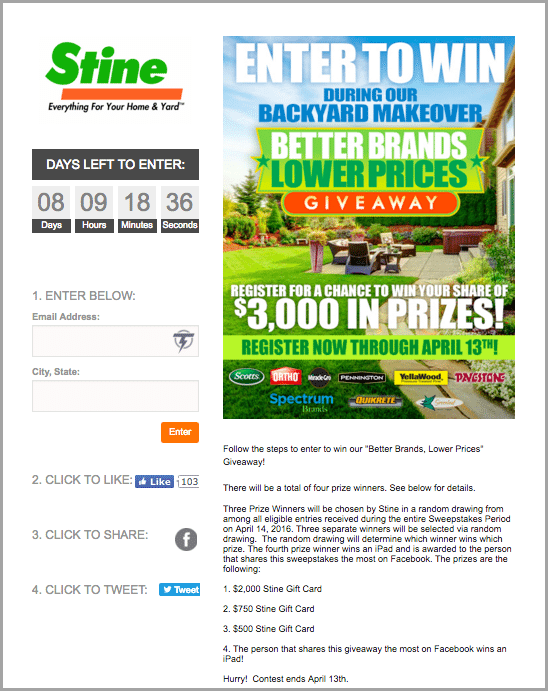 Stine Hardware – So far this smart sweepstakes has collected over 1,500 new email leads for the small hardware store chain. 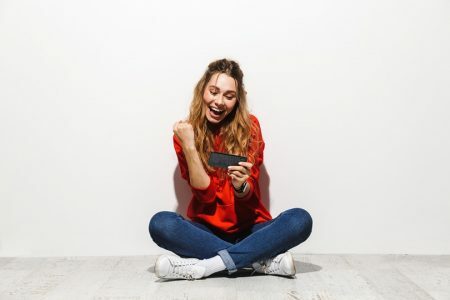 The social contest specialists at Votigo helped Chipotle launch this engaging photo contest, which has already generated 1,000 entries and 20K shares on platforms like Twitter, Instagram, and Facebook. What hasn’t changed with social contests? Much about social contests hasn’t changed, even with the way social media has evolved in recent years. Here are three facts about social contests that still hold true (and likely always will). According to Kinesis, a person will form an opinion about your page and content in .05 seconds. While I know that sounds ridiculously fast, consider the state of the consumer attention span in 2016. Also remember that access to better design tools and expertise has likely raised expectation by consumers. You need to build a contest page that is attractive and digestible to help you get more entries and drive better results. The landing page for your social contest should be clean and modern. You should sweat the details like colors, fonts, and images. Too many businesses treat social media like a broadcasting platform when it’s actually a social platform. Consumers come to a platform like Facebook or Instagram to catch up with their friends and learn about current trends/topics. If you impress them they’ll want to tell their friends about it. 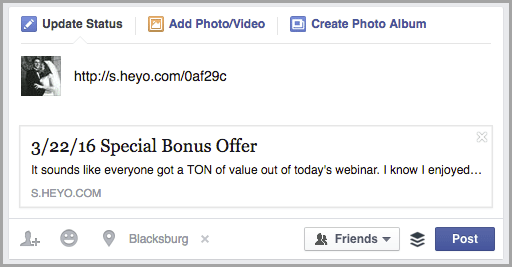 Take advantage of that by building sharing options directly into your contest page. This makes it easy for entrants to share your contest with their friends and followers. I’d recommend including options for Facebook and Twitter at a minimum. They say the number one rule in real estate is location, location, location. Well, the number one rule in social contests is promotion, promotion, promotion. “If you build it, they will come” does not apply here. 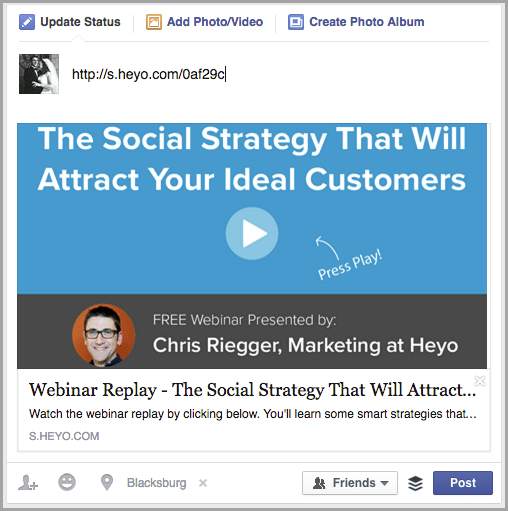 You need a focused promotion strategy for your social contest. I generally recommend that you promote on every available, free channel you have at your disposal. This includes any social media platform where you have an audience, your website or blog, and your email list (Remember, you may already have their email address, but entrants are going to share your contest with their friends and followers as well). I also recommend that you consider smart, well-targeted paid advertising as well. I’ve been especially impressed with the Facebook Ads platform, which allows you to target on a host of different criteria and is not very expensive. PRO TIP: Partner with another small business for your social contest so that you can leverage their marketing channels as well! What has changed with social contests? A lot has happened online in the last 5-6 years. So let’s talk about what’s new. 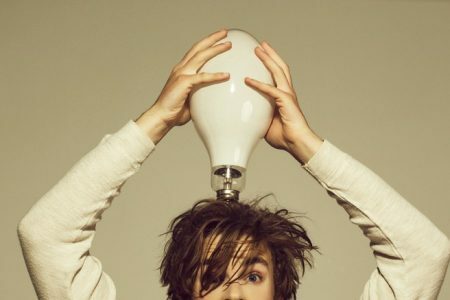 Here are 3 trends that have changed the game for social contests. You need to adapt to these to stay successful and risk falling behind if you don’t. According to the internet trends report from Mary Meeker, in May 2015 we officially crossed the “mobile” tipping point in the U.S. Specifically, we now spend more than half of our time online via mobile and tablet. That’s a big deal, and should be a signal to marketers to consider what needs to change about their strategy. We also recently ran an analysis at We looked across all Heyo customers running social contests to see what device platforms their contest entries were coming from. We found that the percentage of entrants coming from mobile and tablet ranged from 45% to 80% depending on the customer, with an overall average of ~60%. Today people want to be communicated with in a more personal way. According to NewsCred, 90% of consumers want custom content. People also want more control, with 91% of people stating that they have unsubscribed from company emails they previously opted into. Mark my words. No one wants to be at the receiving end of an “email blast”. When deciding how to promote your social contest, make sure that you segment and target as best you can. Targeting based on demographics (age, gender, location, etc.) is good. Targeting based on psychographics (what your audience cares about) is even better. Targeting on both is best. If you’re using paid advertising, leverage channels that allow you to narrow your advertising to exactly the right consumer. Social media ad platforms like Facebook and Twitter are great for this. PRO TIP: Are you a B2B company? Look for LinkedIn groups that align with your industry to reach a concentrated audience in your target market. If you wanted to run a social contest 5 years ago you’d have to do it on Facebook. But the game has changed in 2016. There are many social media platforms out there, each with a large and distinct audience. Decide which platforms you should be promoting your social contest on and then promote your contest in a creative way. For instance, if you’re a photographer with a large following on Instagram, don’t just gram a screenshot of your contest page. Do something more creative, like post an image of yourself holding the custom print you’re giving away as the prize. PRO TIP: Run a photo contest that allows entrants to sync with Instagram and attach a photo from their feed. Running a social contest is still a smart strategy for 2016. 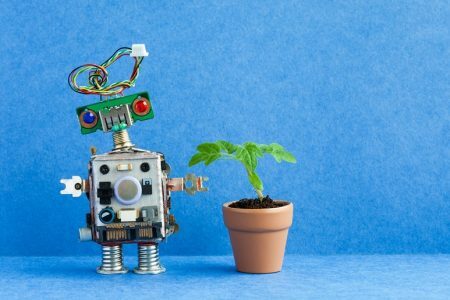 There are some fundamental rules that still hold true, but you also need to adapt with the times to ensure that your contest feels modern and relevant to your audience. Jot down your goal. What is your ideal outcome? More email leads? Better engagement? More fans? Doing this helps you stay focused and make decisions that help you accomplish your goal. Write down what you know about your target customers. Is it a young woman? A middle-aged man? Where do they live? What do they care about? Knowing this helps keep you focused and also gives you ideas about promotion. Select a contest platform. There are many great, affordable options available online, and you don’t need to know how to code or be a great designer to use them. Not surprisingly, I’m a fan of Heyo. It uses a highly visual designer, is easy to use, and is backed with great customer support. You can also compare social contest apps. 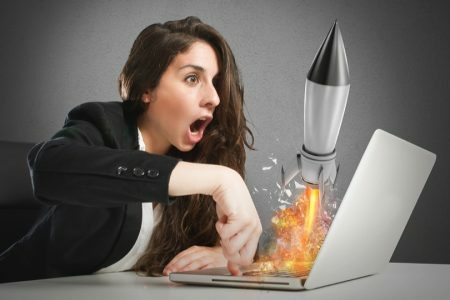 Build and launch your contest. This is the fun part! 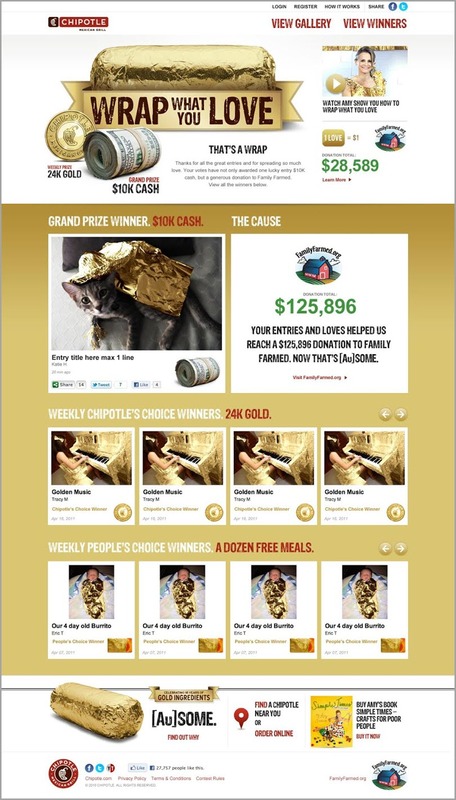 Create a contest page that is bright, inviting, and appeals to your target customers. If you’re feeling stuck you can watch this video to get some design tips. Promote your contest. Leverage every free channel you have available. Then consider smart, paid channels if you’d like. Analyze results. Take a look at your results. If you’re unhappy with how things went, analyze the results piece by piece. Not enough impressions? Then you need to figure out how to get the word out. Is your conversion rate low? Consider a new design or a better prize/incentive. Remember, smart marketers test! I’d love to see how you put these ideas and tactics to work. Share a link to your social contest in the comments below! Guest Author: Christopher Riegger is an expert on growth and list building for businesses. Check out his writing at Growth Fruit.